Murder in North Carolina! What’s in a name? Several 18th century maps depict Murder in North Carolina. 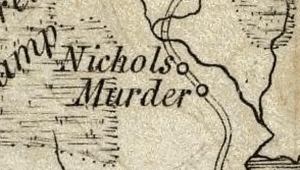 Murder on the west bank of the Pasquotank River as shown on the 1775 “Mouzon” map. The 1770 Churton-Collet map may be the earliest to show this place name. If anyone locates an earlier map depicting Murder, please let us know via the comment box below. The name re-appeared on the 1794 map of North Carolina engraved by William Harrison and published by John Stockdale in London. “Murder” is not found on any of the late 18th century American-produced atlas maps of North Carolina. No record of 18th century Murder (surname) in Pasquotank County has been located via Ancestry.com, FamilySearch.org, or Findagrave.com. One Mabel Murder, born c1907, is listed in Pasquotank County in a 1930 census and a “Benjamin M——- (Murder? )” is listed in an early 19th century census. 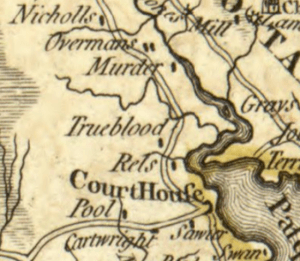 Of course, the real reason this place name is found in Pasquotank County on some 18th century maps is an engraver’s or cartographer’s misspelling of Murden, a surname with a substantial number of 18th century “hits” in Pasquotank County via FamilySearch.org. Robert or Jeremiah would be likely candidates for its initial appearance on the Churton-Collet map. Perhaps a review of land grants could provide clarification. Murder wasn’t the only misnamed place in Pasquotank County on 18th century maps. Stay tuned for a Paquotank County ferry ride on a future post on the North Carolina Map Blog! The author is eternally grateful to the Library of Congress and to David Rumsey for providing the digitized map images used for illustrations in this post. This entry was posted in 18th Century, Map errors, What's in a name? and tagged Henry Mouzon, John Collet, Murder, William Churton by crmaps. Bookmark the permalink.